I knew about the health issue but had not felt the need to “talk” with my RC, we were on polite terms, we said hello in the hall, but neither of us had really gone out of our way to get to know each other, in short R was not someone I would seek out to talk to if a crisis arose (or any other time, unless I needed to call “in” to be excused from classes). She launched into a series of prying questions, I didn’t really want to share, but felt pressured to do so. I made my best attempts at polite, non-committal conversation while revealing as few details as possible, and then R dropped the bombshell. That’s paraphrased a bit, but that was the gist of the message I walked away with. It was a good thing my parent had nearly died. It was a chance for “spiritual growth” for my family a “learning opportunity” if you will. Christian Scientists do not handle life-threatening illness well. My friends and I gave my RC a pass because she tried, and CS does not equip us with the language and construct with which to process it. I also made a point of avoiding the RC for a while as both of us seemed a bit embarrassed by her statement. When I shared the incident with another individual (a lifetime member whose parents had been lifetime members as well), she went off on how what my RC had said was “NOT Christian Science!” but seemed incapable of offering a better way for her to have handled it. I’m sorry to hear your parent is having problems. I understand what you are going through. I’m not going to lie, it does not get any easier, and often it does not get any better. If you ever need to talk, or cry, or get a hug, please know I’m here. Following this up with an actual hug or cookies is always welcome., If they live farther away a little “thinking of you” card is considerate. A little compassion goes a lot further than claiming “God” is “testing” my faith, because really, I don’t need a God like that in my life. 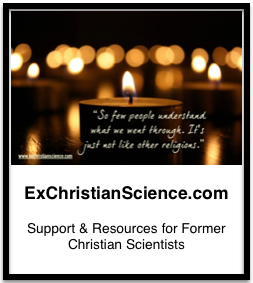 This is the first in a series of posts about what is “NOT Christian Science!” They are incidents that happened that other CS have loudly condemned as “NOT CHRISTIAN SCIENCE!” My question is if it isn’t Christian Science, then what is? Many times the person doing the “NOT CS!” was/is an active, longtime, class taught, authority figure (Sunday School teacher, college RC, teacher/professor), so if they’re not doing it “right” than who is?